Am I the only one obsessed with twirly ends on a well blocked crescent shawl? I discovered them last year after playing around with a lot of blocking and have fallen head over heels. 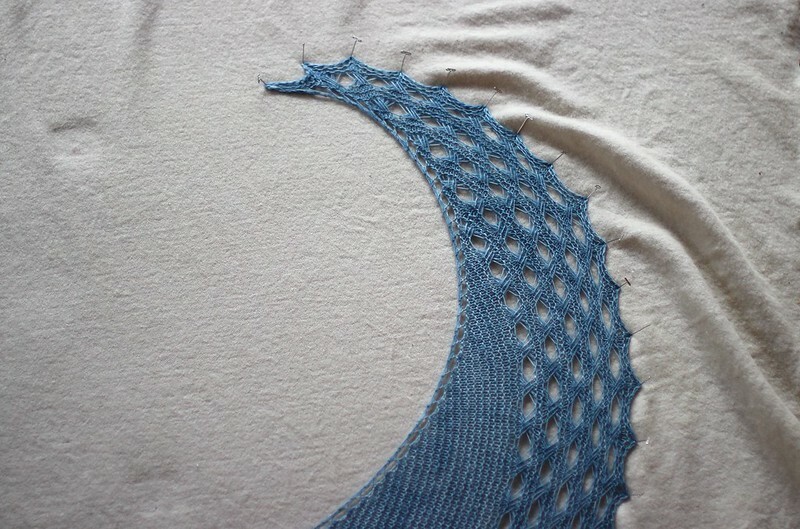 I see a lot of photos of shawls stretched out for blocking. Lots of you send them to me (thank you! ), I spot them on Ravelry and there are plenty on Instagram too. I must confess to often wanting to reach into the photo and do a little rearranging so your shawl blocks out even better. A well blocked shawl is usually bigger, smoother, shows off the lace more clearly, drapes beautifully and is easier to wear. Triangular shawls are fairly easy to block. The shape is obvious - the top edge lies straight and the body pulls outwards and down to a neat central point. It's crescent shawls that seem to cause most of the confusion. Crescent shawls that start at the top centre with a couple of stitches look as if they want to sit with a lump in the centre of the top edge. It's difficult to see that in fact that lump can be curved right around so that the top edge ends up a neat "smile" shape with the ends of the shawl swooping up and sometimes nearly touching at the top. I find wires are super helpful to get good smooth edges on shawls, no matter what the shape. And T pins are fantastic too. I know that you can substitute regular sewing pins but I think the T pins are a great investment if you're planning on knitting a few shawls. They're strong and will hold your shawl exactly where you want it. 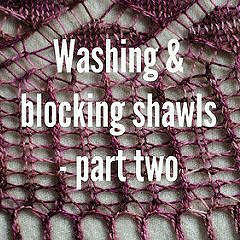 I made a couple of tutorials last year to show you how I block shawls and I've included links to them below. If you're keen on twirly ends and shawls that drape beautifully, do take a look! Righto, so you've followed part one - soaked your shawl and rolled it in a towel - now what? Blocking. That's what. Pinning out a shawl is a slow business. I often take between 30 minutes and an hour to pin out a shawl. 1. Find a space to lay out your shawl and grab your tools. Then stretch your shawl firmly but gently along the whole top edge (especially the centre) to stretch it out as much as possible. I like to block my shawls on the floor so I can spread them right out, crawl around and view them easily from above. There are lots of things you could use to spread your shawl out on. I use a large wool blanket and pin through that into the carpet. 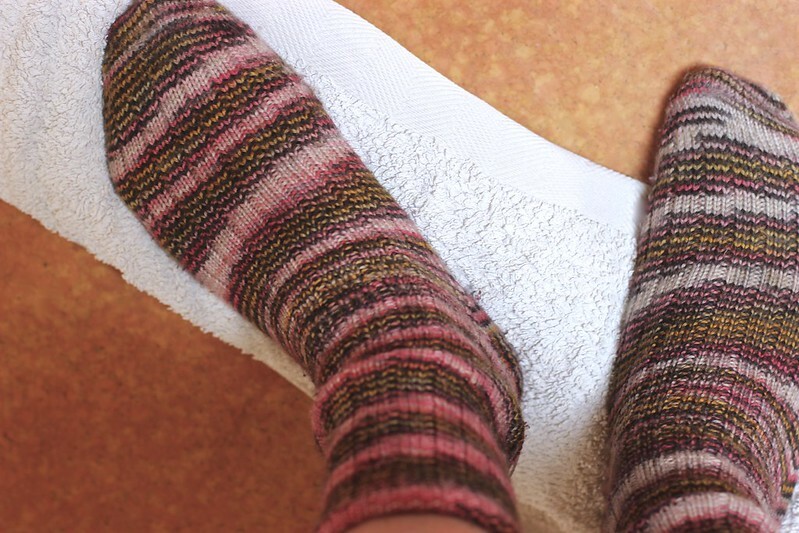 If you have wooden floors you'll probably want to invest in some foam pads. You can buy blocking mats although some people make do with yoga mats and kids foam puzzles. I have recently started using blocking wires and I absolutely love them. 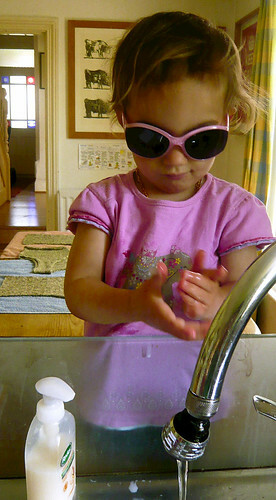 I was a bit daunted until I tried them and realised how simple they were to use and how much easier it made things. At the very least I recommend T pins. They're strong and long and perfect for holding your shawl in place while it dries. You can use them on their own or together with wires. My blocking wires are made by Lazadas. I've got a set of long blocking wires (which came with some pins). 2. If you're using blocking wires - thread your wire through the stitches along the bottom of your shawl or the picot points if it has some. It takes a while but it's worth it. 3. 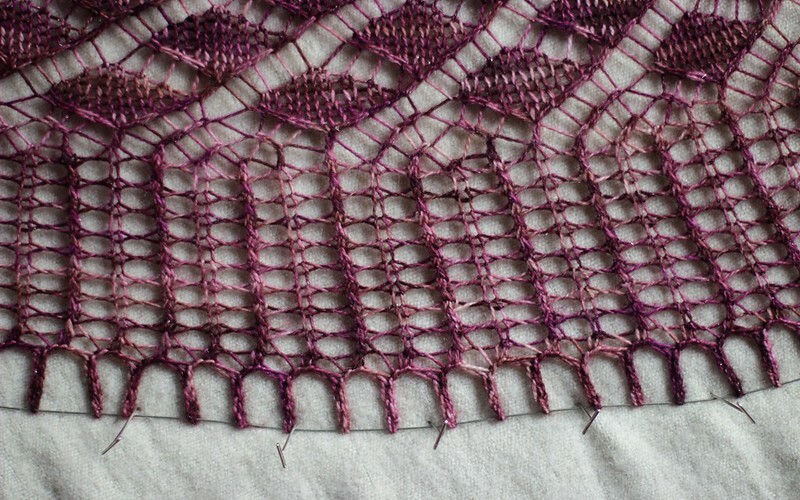 If your shawl is wide or your wires are short, use extra wires and overlap them where they meet for a few stitches. I tend to use two long wires for my shawls. 4. 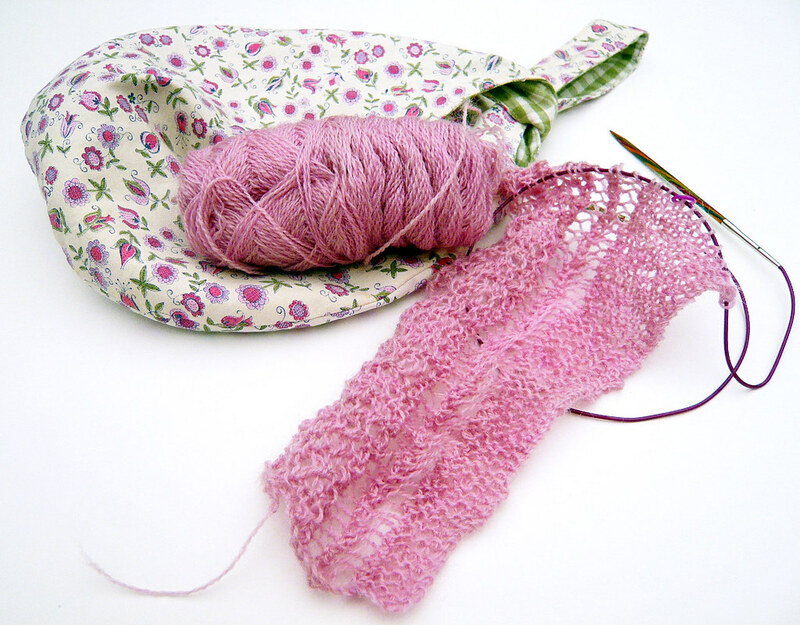 Lay your shawl out in roughly in the shape you're aiming for. You'll see that I've blocked crescent shawls in my photos. Notice that the top edge curves upwards. It may look like your shawl has a lump in the middle when you're knitting it but that lump can be flattened right out and curve upwards on itself. 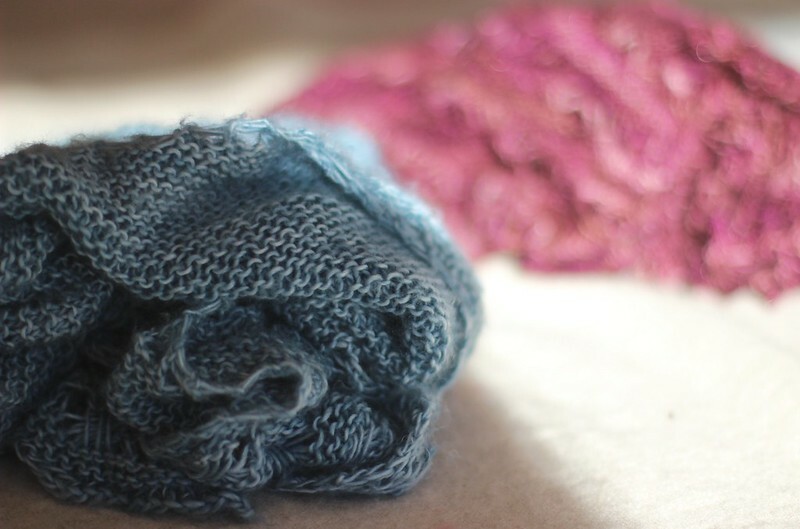 This will make the wingspan of your shawl wider and your shawl easier to wear. 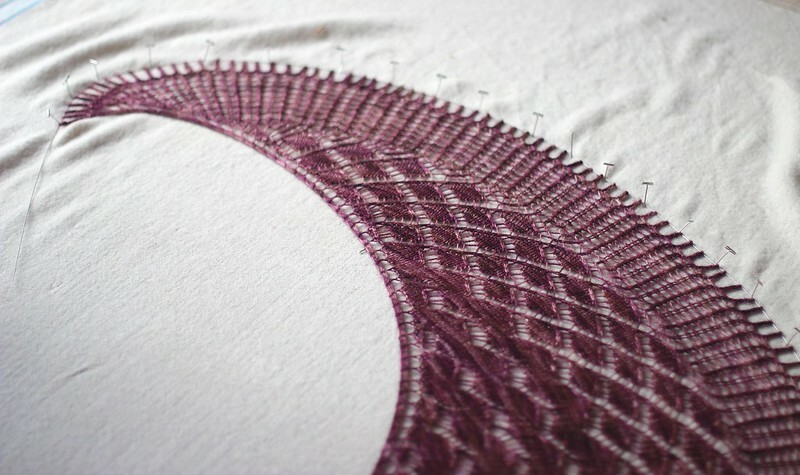 If you're blocking a triangular shawl the top edge will (mostly) lie flat. But, sometimes triangular shawls will also curl up at the ends too (like my Southern Shawl) - it all depends on the way it's been increased along the edges of your knitting. Lots of edge increases correlate to more steeply curved ends. Play around with your shawl and see how it wants to spread out. 5. I usually start pinning at one corner, pulling the lace open. 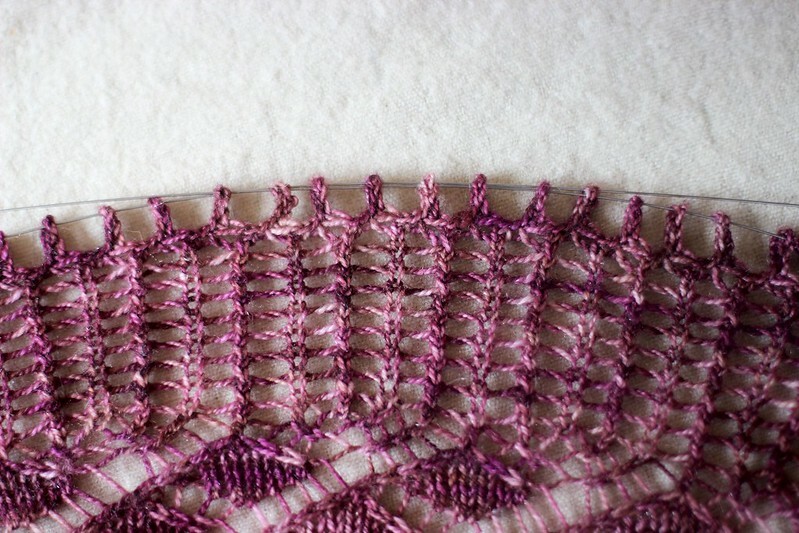 As you pull the border downwards and work your way around the shawl your top edge will tighten. 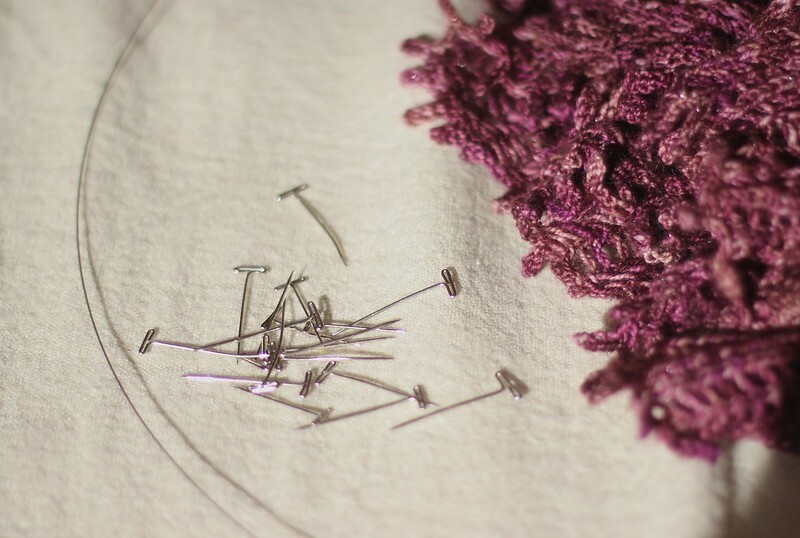 You can keep gently but firmly stretching that top edge as you pin to get more length into your shawl. 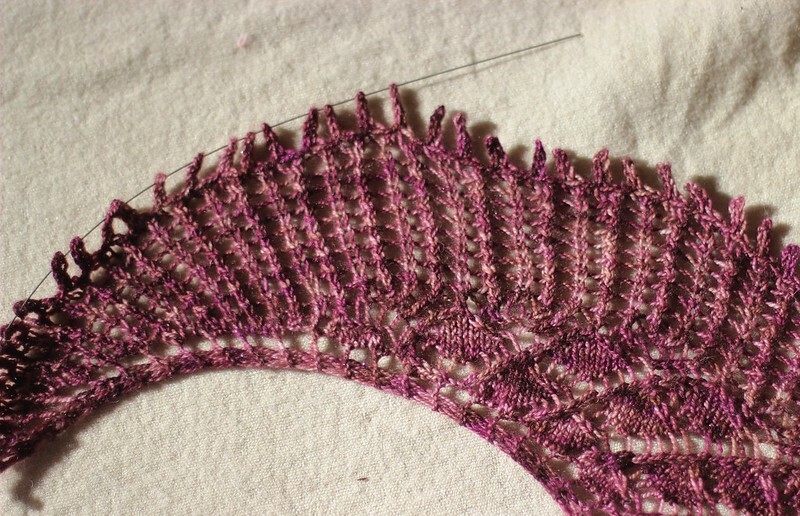 I usually end up re-pinning lots of times as I get the shape of the shawl just right. 6. Sometimes I pin the top edge temporarily while I'm stretching and pinning the border out but I take those top edge pins out once I get going because the top edge will lie well without pins. It helps to get the corners pinned and then go back and readjust along the border. 7. Crescent shawls want to scoop inwards and around at the ends into a horseshoe shape. 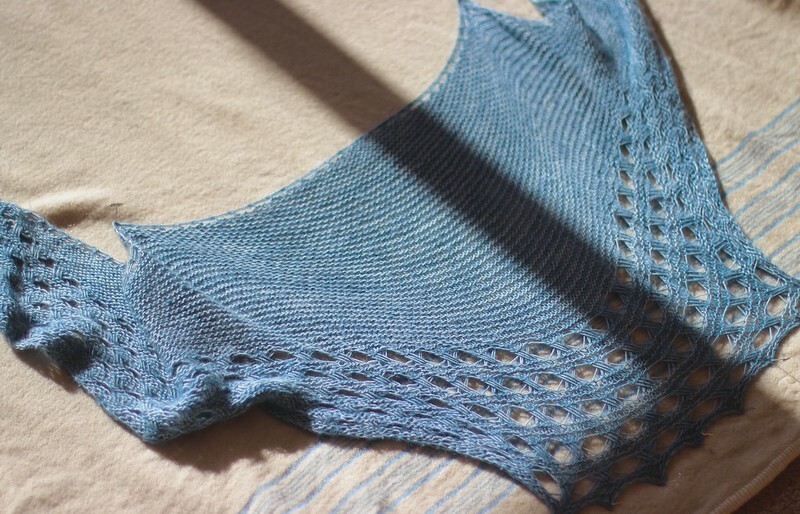 Some (like my Antipodes Shawl) scoop around almost full circle. 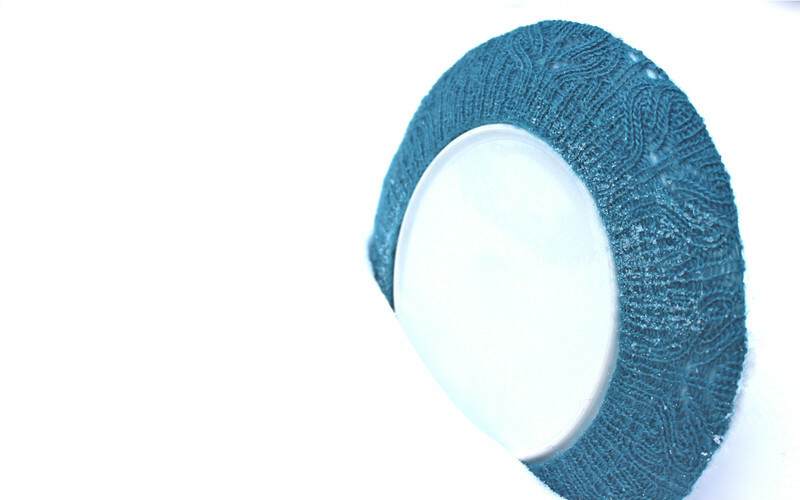 Play around and see what curve your shawl wants to adopt. 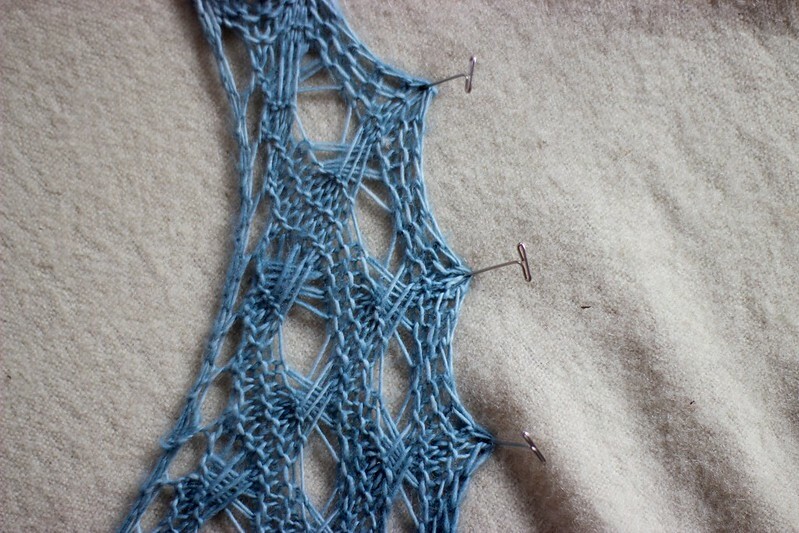 I spend a lot of time fiddling with my pins as I go, pinning and repining to get the lace open and the shawl curved. 8. You might like to experiment with how you block the border edge. Sometimes the pattern wants to fall into little points. 9. 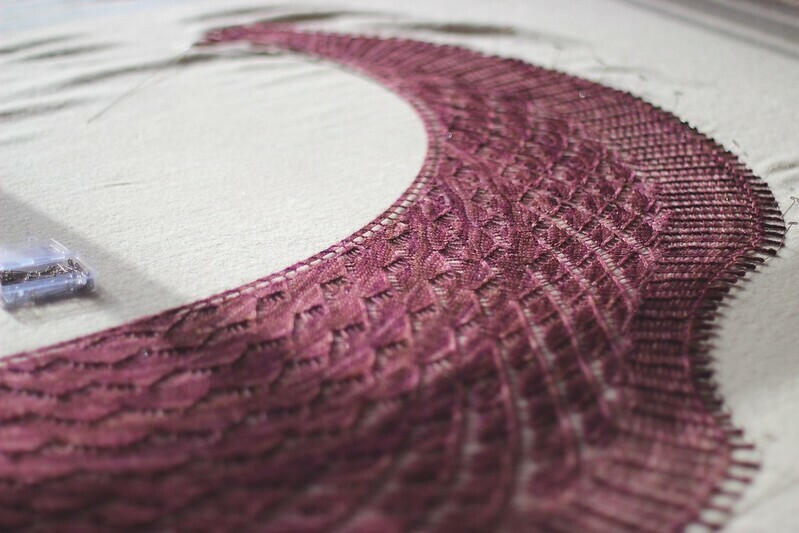 Blocking wires make it easier to create curved edges on your shawls and they also make blocking picot points a breeze. 10. I try to get my shawls symmetrical if they're designed that way but it can be super tricky to get them exactly right. 11. 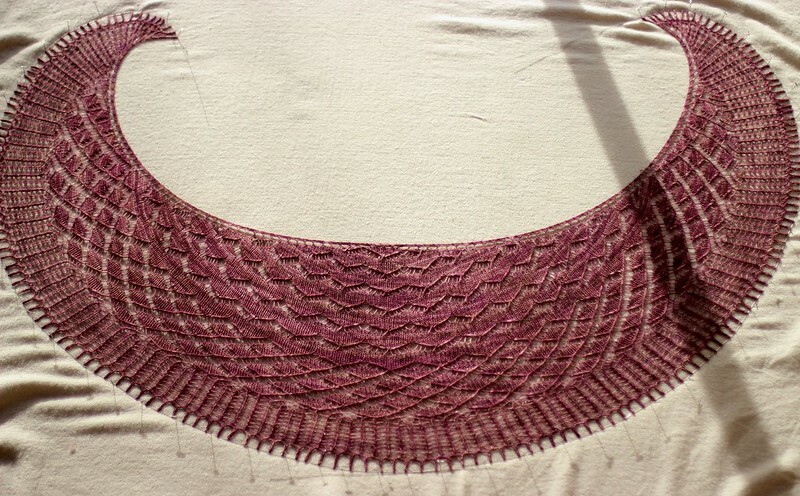 Once finished, your shawl may feel a little like a trampoline - tightly stretched. That's how I like mine. 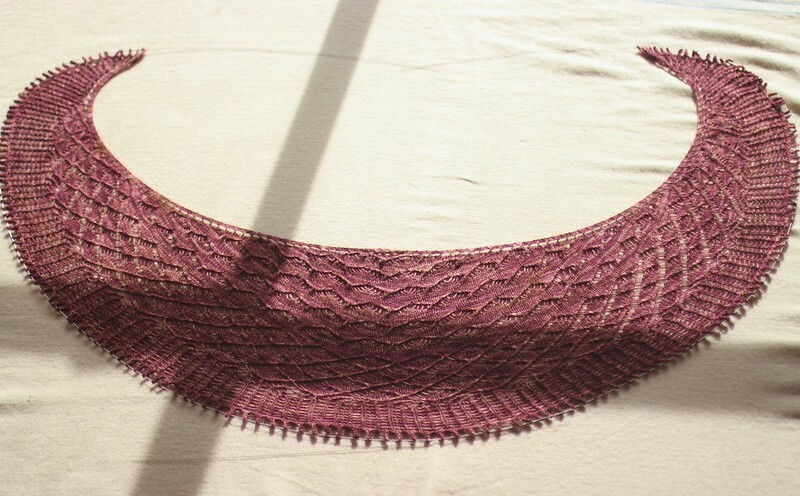 A shawl that is blocked tightly in a scooping curve with the top edge stretched, the border opened right out and and the ends curling inwards will drape beautifully. 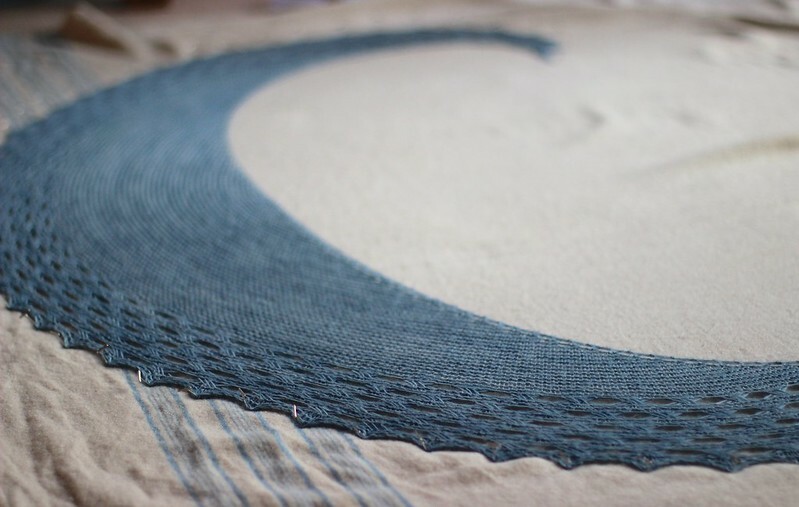 I love a well blocked shawl that falls into gorgeous spirals at the ends when it's worn. Leave your shawl to dry for a day or so. Then, unpin it, throw it around your neck and ENJOY! If you still want more information and details, I talk at length about how I block my shawls on my podcast if you fancy watching that too. It wasn't long ago that blocking was a complete mystery to me. I finished my knitting, admired my handwork and that was that. Nothing was soaked or washed until it was dirty some time later. These days, after learning a little about blocking and trying it myself, I'm a complete convert. 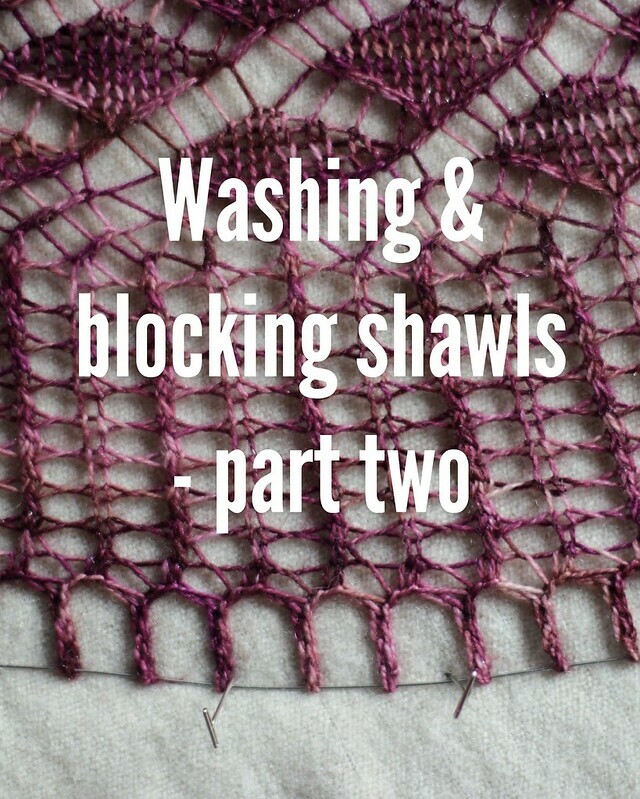 Blocking is nothing short of magic - especially when it comes to shawls and lace. Recently, I've been noticing some degree of panic amongst many knitters when the word "blocking" is mentioned. Trust me, it's not tricky. 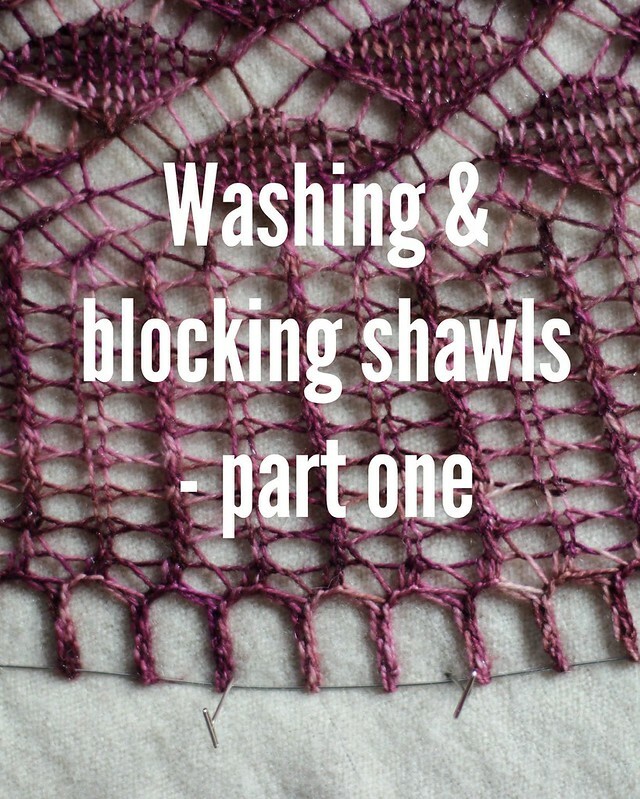 There are a few tools that make it easier to block a shawl and some shapes that you're shooting for when you're laying it out, but overall the whole thing is not difficult and actually quite pleasant. To help you make sense of blocking I thought I'd show you you what I do with my shawls once they're off my needles. Because it's a long process I've split it into two parts - soaking, then blocking - but I do one straight after the other while my shawls are still wet. Before I begin I have to say that like knitting, there is truly no one "right" way to block your shawls. I've worked out a way that I like through trial and error. If you have any tips or tricks that you've found useful I'd love to hear them and please feel free to fiddle and experiment until you find a method that suits you. 2. 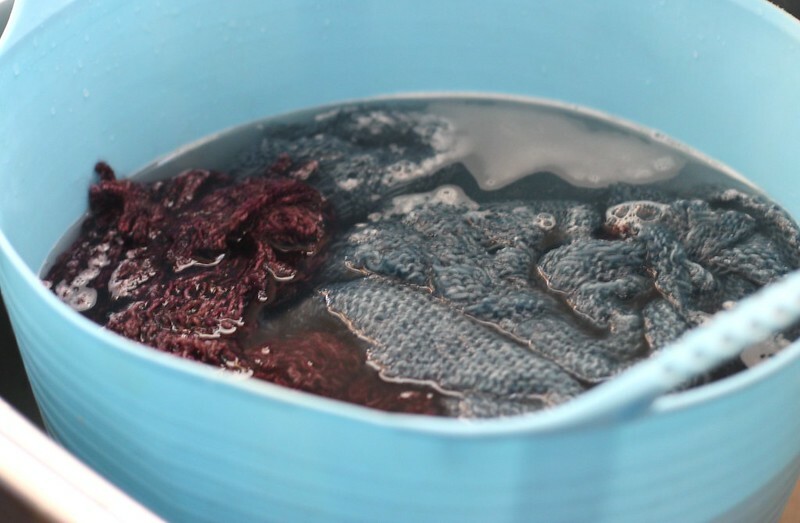 Gently squeeze the water from your shawls. Don't wring them, just squeeze between your hands until the worst is out. 3. 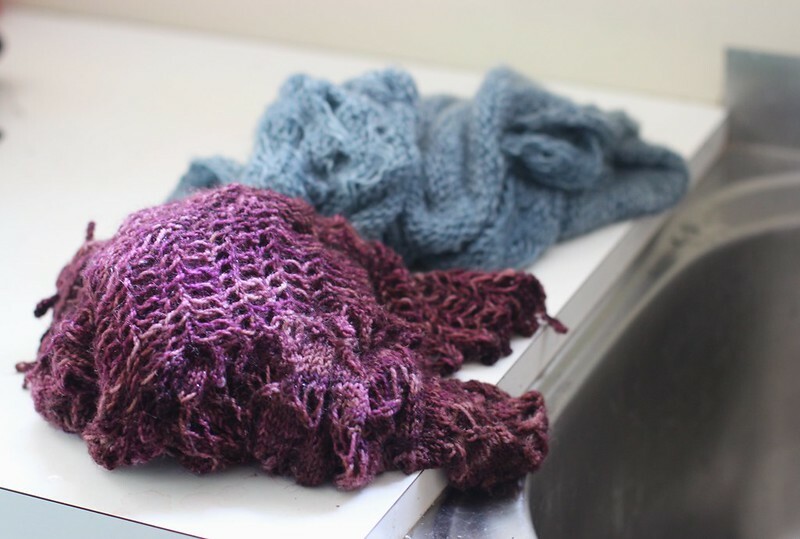 Lay your shawl flat on a big bath towel and roll the towel from end to end. 4. This part is fun - walk up and down on your sausage roll towel. You might find that other people like doing this job for you. 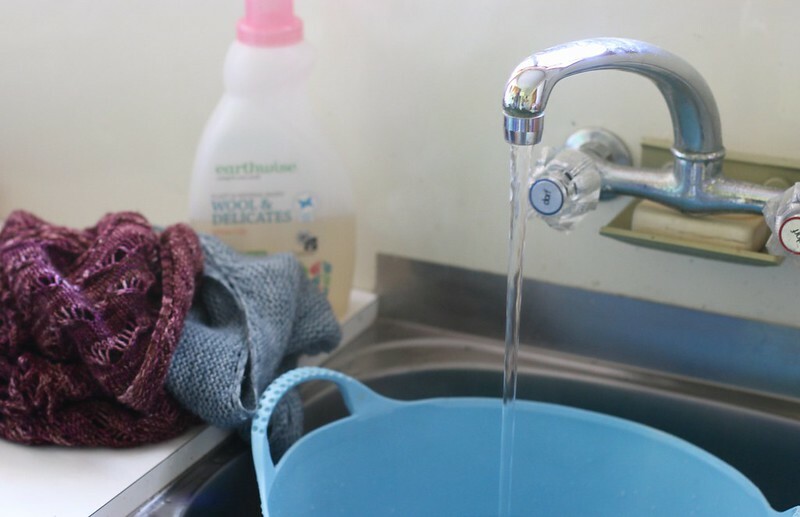 Giving your towel a good kneading will get most of the water out of your knitting. 5. 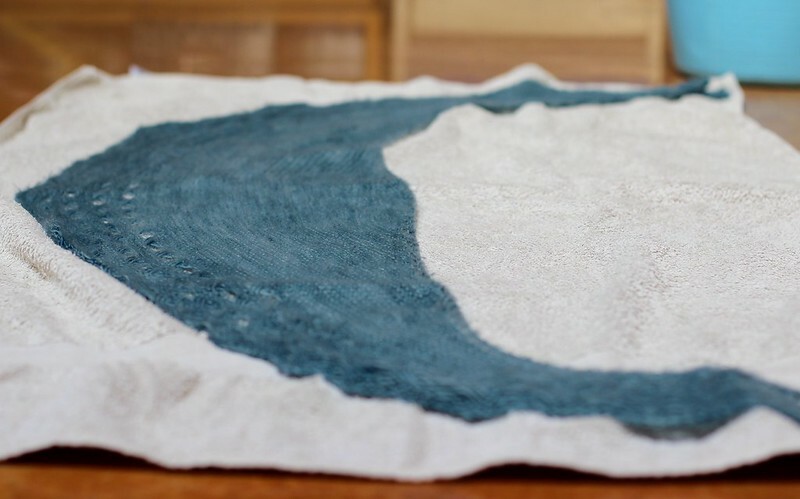 Unroll your shawl from the towel and get your blocking surface ready. Ready to block your shawl? 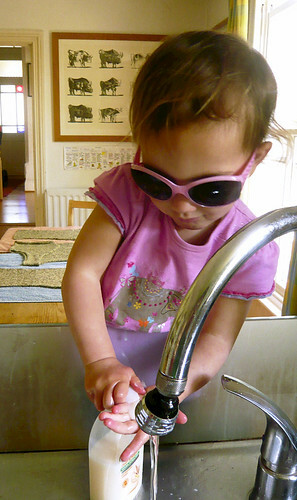 Head over to part two to read how I do it. My 50-something rows of lace are done. I won't lie, it wasn't all plain sailing. Lace & small children and lace & gripping TV don't mix. I lost my place a million times, reknit little sections twice and ripped out a bunch of rows once. But, in the end, I got to the top of the chart. I haven't checked carefully for errors but there is nothing glaringly obvious jumping out at me. Because it's lace, at first I panicked that it was too small... but a little soak and blocking have allayed my fears. The lace has opened up beautifully and I'm terribly proud of my little bit of lace knitting. Isn't it pretty? Did you know you block lace berets (all berets I think) on dinner plates? It seems unlikely that the tiny thing will stretch over but it does. It's quite ingenious. 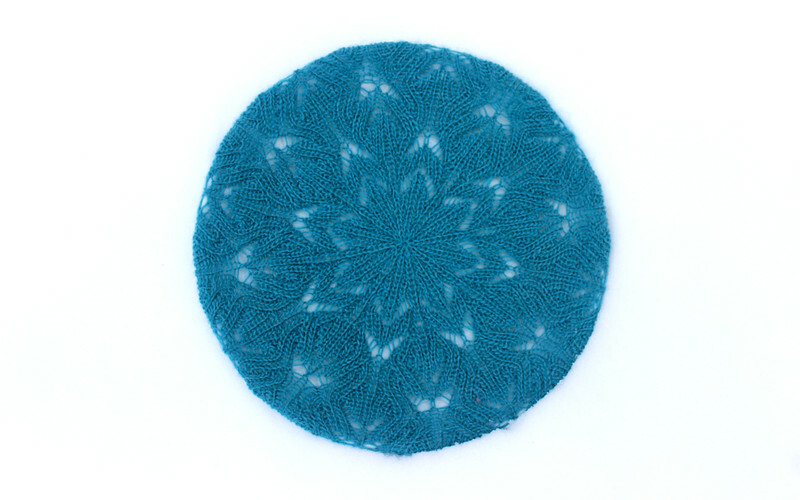 The ravelry project page for my lace beret is here. I'll model it (with my finished outfit) soon. We've had a funny old few days here at Truly Myrtle... it started right after I finished my last post, just minutes after actually. It's funny that something so small and innocuous as a cup of tea can cause so much trouble. Well, let me tell you, it can. Especially when it's tipped over a computer. Yip, you read right. I ignored that most sacred of rules - do not consume beverages near the computer - particularly when wrestling with toddlers at the same time. After my little accident, I'd go as far to say that toddlers, tea and computers should not occupy the same room at the same time. Well, my toddler and my tea collided (I'm not blaming her, really, it was totally my fault...) and the computer was drenched. Mr Myrtle was less than impressed. Voices were raised and I may have seen smoke waft from his ears. As a result, we were unplugged for a few days while the poor computer dried out. I could still get onto the internet on other devices, but couldn't get to my emails, nor check the regular stream of blogs delivered to my inbox. And, man, do you guys write a lot! I had soooooooo many emails to catch up on ..... So, yip, the computer dried and rather miraculously survived, and I am banned from drinking tea within a six foot radius of the poor machine. You'll be pleased to hear that I made good use of my time. Just look at that basket of lusciousness! 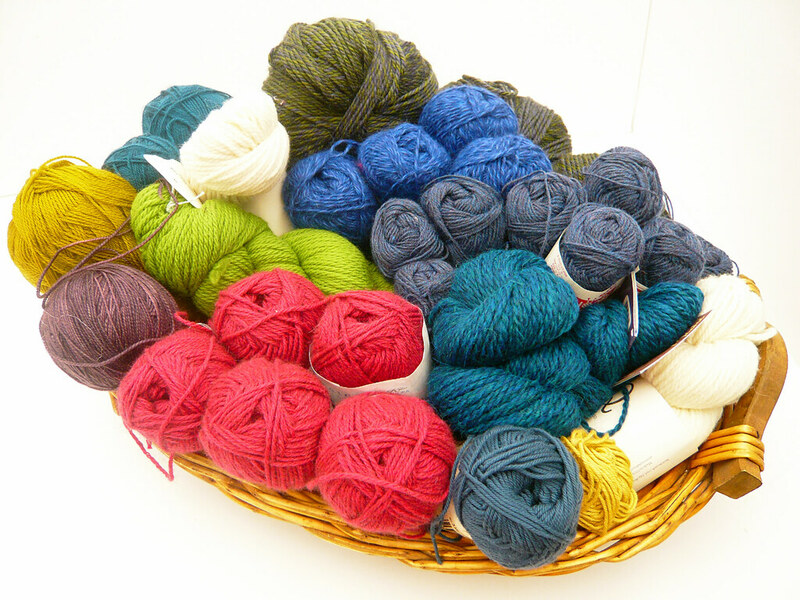 I raided my stash, pulling out skeins and balls that just NEED to be knitted into lovely things and then I searched Ravelry to see what other people had made with these yarns. Oh my, what an awesome feature. I found some fantastic patterns, popped them in my queue and now have the exciting prospect of knitting them! I am truly suffering from "want to knit all the things" syndrome, aka startitis. I'm still plugging away with my Everyday Cardy. It's mostly knitted up and I've been procrastinating over sewing the sleeves in, such is my aversion to sewing up. When I read that the Yarn Harlot always blocks her pieces it was all the ammunition I needed to delay further. If she does it, then clearly, so must I. 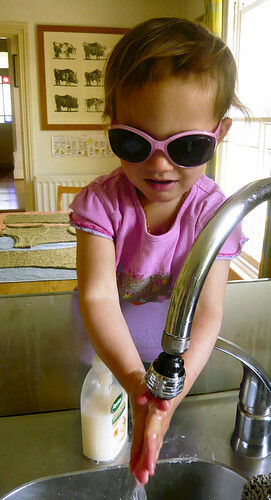 And there, behind my little tea-tipper doing what she loves best, is my Everyday Cardigan, washed and blocking. Not to be put off by a little lace knitting, I've cast on another little something with stash yarn (I've been warning you there's a lot...). This pretty pink is a ball of Romney I picked up in New Zealand years ago from the lovely lady just out of Cambridge. I'm not sure that she's still spinning and dyeing? I'm making Unleaving by Lee Juvan. It's a free pattern from Knitty and I'm knitting it shorter because I have a little less yarn than is called for. Okay, so it's a little ragged right now, but I am super pleased with it because the lace is ever so slightly complicated and I am managing it in spite of kids interrupting. The secret has been my pencil and my religious marking off of rows on the pattern. I don't breathe much while I'm knitting it, so it's being done in small bursts. 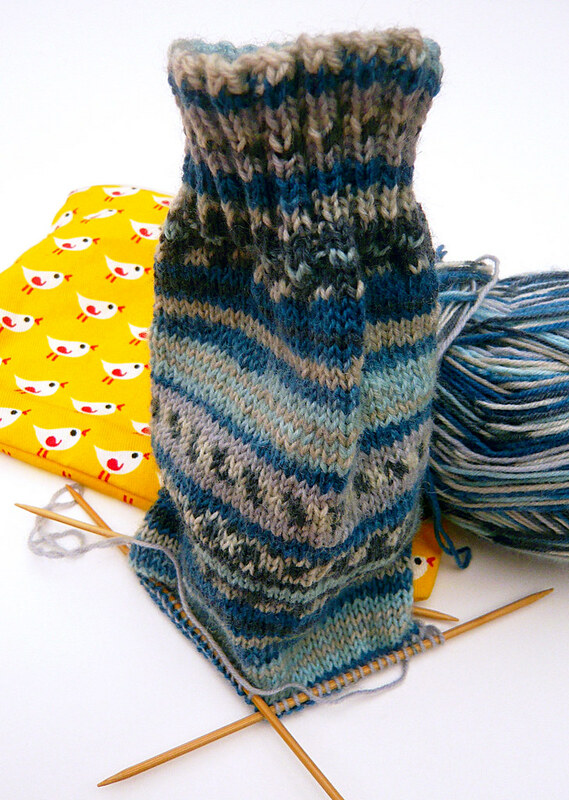 The last piece of knitting on my needles is this sock. The first of a pair for Mr Myrtle. I'm knitting plain socks, cast on 64, knit two, purl two rib for a bit and then stockinette until the heel. Perfect knitting for school sports day, which is where it started. Great for chucking in the top of my bag as we head out the door and great for sitting under the tree in the sun in the school playground after school while chatting to other mothers. And, before you ask, I'm the only one there knitting. The yarn is from my stash, I bought it in France last summer from a tiny wool shop, at a rock bottom price. Details of all my projects can be found on my Ravelry page.